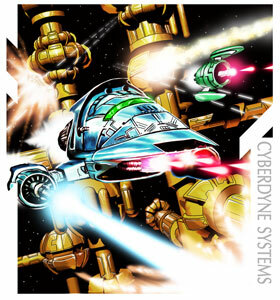 Psytronik Software in association with Cyberdyne Systems and www.scaryfish.tv are proud to present ARMALYTE - One of the best shoot 'em ups ever to be released on the C64! For the first time ever the Competition Edition of the game is available as a proper C64 commercial release! Enter the forbidden zones with ARMALYTE ... Two freedom fighters lost in eight sections of a deadly galaxy, their own determination and control are the only elements standing between them and oblivion! ARMALYTE: featuring eight levels of frantic shoot 'em up action, requiring nerves of steel and a sharp eye for the invading forces. With stunning and original graphics, animation and tracks of superlative music and sound FX. This is the biggest blast since the big one! · Brand new full-colour artwork! · Competition Edition of the game featuring level-select, adjustable enemy bullet speeds, scrolling demo mode + more! · 8 Massive Scrolling Levels! · Incredible Multiplexed Enemy Attack Waves! Armalyte Pic - A stand-alone demo featuring the stunning loading screen by Robin Levy along with the Armalyte loading music by Martin Walker. Walkers Warbles 1 - A music demo featuring four example tunes by Martin Walker. Walkers Warbles 2 - Another music demo, this time featuring five tunes by Martin Walker. Armalyte Demo #1 - A very early demo of Armalyte showing the sprite multiplexor in action along with background graphics that weren't used in the finished game. Armalyte Demo #2 - A more advanced Armalyte playable demo, once again featuring background graphics that were not used in the final game (although they may have gone on to inspire the crystalline graphics featured in level 6 of the completed game). Armalyte Demo #3 - A much more advanced demo that looks and plays a lot more like the Armalyte game we know and love. Armalyte 2 Preview - A demo giving a tantalizing glimpse of the sequel that was not to be.